The Gold Cube trommel kit is made exclusively for the Gold Cube! Put this mini 5 inch trommel on the top of your Gold Cube to spin your material and wash completely with no classifying. Speed up your production and run more dirt! 16 inch long barrel x 5 inch diameter, classifying to 3/16 inch. Tested and approved by the inventor of the Gold Cube! IMPROVED as of August 20, 2016! The spray bar will no longer be on the inside where flat rocks can some times cause a jam. It is now on the outside where it will actually keep the little rocks out of the holes. Users can now pivot the spray bar assembly to make it easier to clear plugged holes. There is also a chute at the drum exit. This kit is self jigging to the Gold Cube. 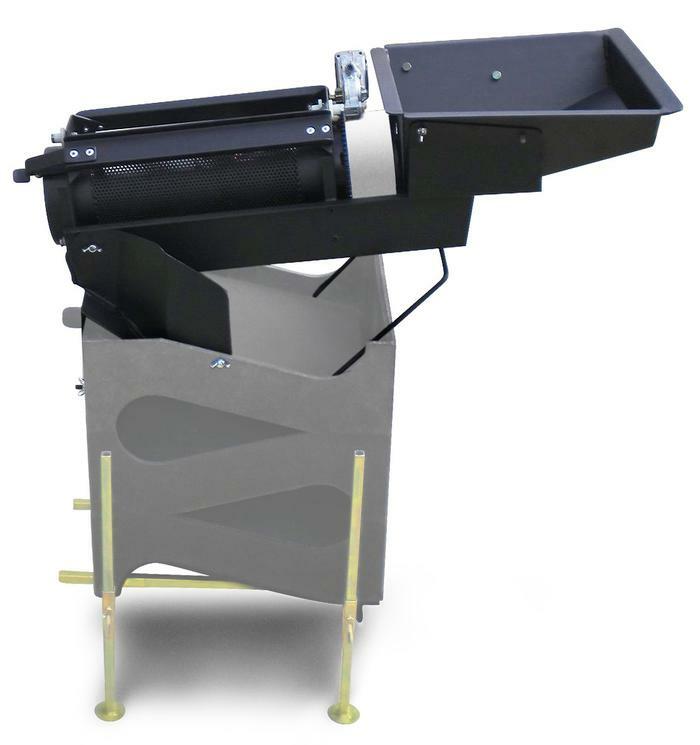 It consist of a 12 volt 5 inch diameter trommel top unit with a 16'' long barrel and a 3/16'' classifying screen. You also get an adapter plate to attach the trommel to the Gold Cube and an angle adjustment bar for adjustable pitch. The Trommel can also be taken off when you need to use the cube as is or with a Gold Banker. The hopper and barrel both have a sprayer so cleaning your material is automatic as well as also providing the proper amount of water to the Gold Cube. Gold Cube Trommel ships in a 14 x 14 x 37 inch box weighing 22 pounds. Gold Cube needs to be purchased seperately, it does not come with the Gold Cube Trommel.